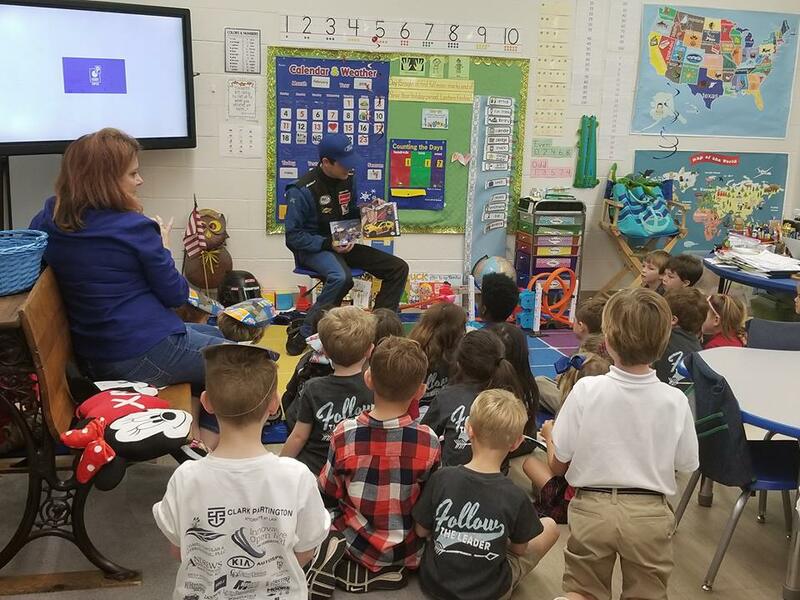 As if the life of a high school senior and an ARCA driver doesn�t keep him busy enough, Ronnie Osmer is using the off time between races to promote the latest children�s book based on his racing career, �Racer Ronnie: The Friendship Race�. The Friendship Race is the second installment of the successful series of Racer Ronnie Childrens Books created and written by Sandra Keen, Michael Keen, and Jessie Keen. �The Friendship Race� is about young racers who race hard on the track and encourage each other to achieve their goals on and off the track. Osmer has been all over the Gulf coast with the book making his latest stop at Episcopal School in Pensacola, Florida. �The kids have been terrific everywhere we�ve been. They always have great questions and of course some funny ones, like how do you go to the bathroom. I have a blast being with them and it�s certainly rewarding to have such a big impact on their day,� offered Osmer. Next up on the book tour is St. Benilde School in Metairie, Louisiana. The third installment of the Racer Ronnie Books has been completed and is currently is being illustrated and should be available in 2018. 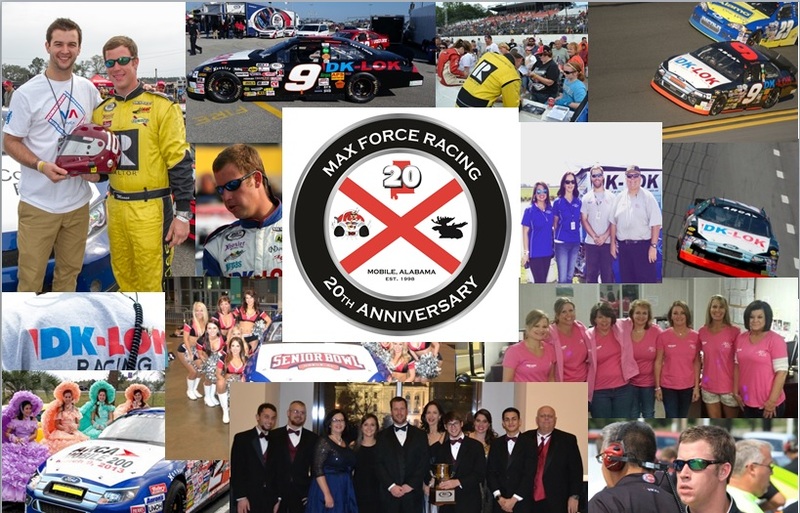 If you would like to have Racer Ronnie in your school please contact Max Force Racing at tpraytor@aol.com. At Daytona International Speedway competitors and their crews prepare for the unexpected, almost anything can happen and when you think you�ve seen it all, Scotts Rookie of the Year Challenger Ronnie Osmer adds a new one. Osmer rolled his Hub International/Supreme Ford-Slidell Fusion on to high banks of Daytona for his first Lucas Oil 200 driven by General Tire looking for a solid day and making all 200 miles. The Green flag signaled the beginning of the 55th running of the ARCA Series at Daytona and Osmer quickly brought his HUB/Supreme Ford-Slidell to life. �Lots of nerves leading up to the race but getting in the car and taking the green flag really got me focused on my job and let me shut out everything going on around me� said Osmer. Osmer�s Ford circled the World Center of Speed at a pace close to 180 MPH and the Scotts Rookie was having a text book first start at Daytona. Osmer was settling into the demands and G Forces of the draft when just past the � way mark things started to go bad, really bad. Osmer quickly put his wounded HUB/Supreme Ford down on the apron and made his way to pit road. The team pushed his lifeless machine back to the garage while the driver made the mandatory trip to the infield care center. 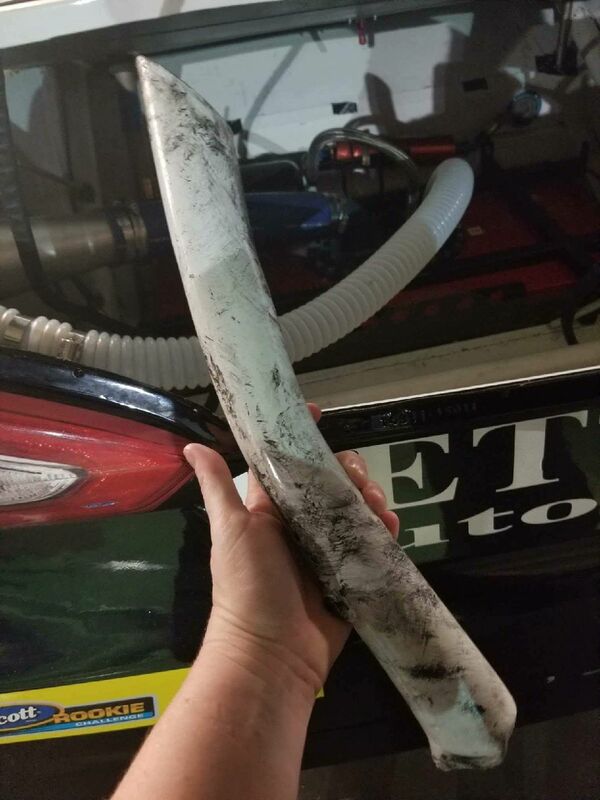 Back in the garage, the team searched for the issue with the motor and found a foot and a half piece of bumper bar in the trunk. The bar had come off another car, going through the front of Osmer�s Ford taking out oil and water lines on the motor before blowing a hole in the crush panel of the trunk and landing in the rear of the Ford. 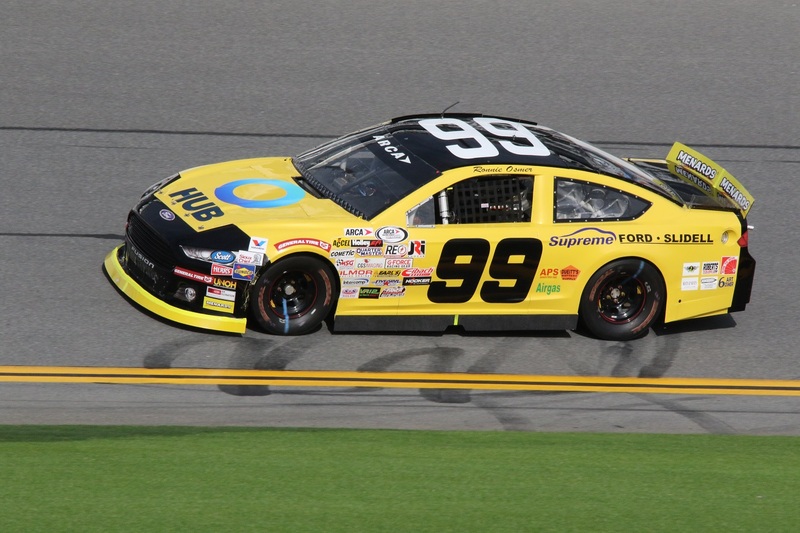 Scott Rookie Challenge candidate Ronnie Osmer has teamed up with HUB International for Osmer�s first start at Daytona International Speedway. With over 10,000 agents HUB is one of the largest insurance brokers in the world, and represents a broad, deep, one-of-a-kind aggregation of insurance entrepreneurs. HUB offers a wide variety of personal and business insurance with over 400 brokerages in the US. �We have been watching Ronnie work his way up through the racing ranks and we are excited about being part of his first start at Datyona,� offered Donald Pecot, Sr, Vice President, HUB International. Osmer will pilot a Ford Fusion made possible by Louisiana Ford Dealer, Supreme Ford in the Lucas Oil 200 driven by General Tire on February 10that Datyona. The ARCA Racing Series will be making its 55th appearance at the World Center of Speed on February 10th at 3:45 CST live on Fox Sports 1. CHASSIS MF009: Supreme Ford�s 275+ employees are the power behind Osmer Fusion Chassis 009. SPOTTER: David Pepper, General Manager ThorSport Racing. ASSOCIATE SPONSORS: J-Wire, Inc. Larry Trumbaturi Drafting, Arata and Arata Law Firm, RobertsTechJobs.com, Nudraulix, Rettigs Auto Body, APS Automotive Painters Supply, Dueitt�s Battery Supply, Airgas, Golden Flake. Mobile based Max Force Racing tested two drivers, with two different agendas during the ARCA Series test at Daytona International Speedway-both accomplished their task. For the 18 year old Pearl River, Louisiana native, Ronnie Osmer�s task was simple, make laps, get comfortable and earn his ARCA Superspeedway license. For the Ironman of the series and one of the drivers with the most restrictor plate laps at the test, Thomas �Moose� Praytor�s task was different, improve on the Talladega Test and get ready to run up front. The addition of the second car for the test put a lot of pressure on the all volunteer team from Mobile, Alabama. In the two weeks leading up to the test all of the resources the team could muster were working towards having the 2nd car ready. Even with everyone working well in to the night and 48 hours continuously before leaving the team was behind. The DK-LOK hauler arriving on Friday afternoon, just in time for it to rain. The team used the rain to finish up minor items on the cars, starting fresh on Saturday. Praytor took the second car out for its first trip at the World Center of Speed, making sure it was good to go and turned it over to Osmer. As with every new driver at Daytona there is a learning curve, the hardest are, don�t let off the gas and don�t run off the bottom of the racetrack. Osmer�s first few laps were tentative, as they should be, then the young Rookie started dropping his lap times picking up speed and confidence. While Osmer was getting to know the track, Praytor was at home hammering out lap times in and out of the draft putting his car through it�s paces preparing for ARCA�s 55th return to Daytona. With the test winding down Praytor took to the high banks of Daytona one final time with his Rookie teammate in tow. �We wanted Ronnie to draft some before leaving so he could get a feel for the draft if he gets an opportunity to race here,� added Praytor. The pair of 9�s were soon making tracks at the World Center of Speed and it didn�t take the 18 year old long to have a handle on the draft. �Really appreciate Thomas spending so much time with me showing me the way around the track in the draft. When we got lined up nose to tail my car really took off,� Osmer. Missions accomplished, Osmer received his Superspeedway license and Praytor is ready to return for the Lucas Oil 200 driven by General Tire on February 10th.